Dimensions: 9-1/2 x 8-1/2 in. 80 pages. Ribbon marker. Space for over 50 personal photographs. Hardcover. 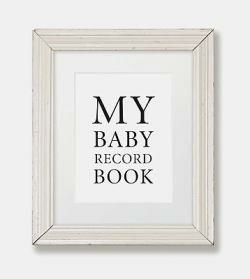 Record precious memories of your baby's first years in this elegant five-year record book which includes an envelope for a lock of your baby's hair and a section where loved ones can write special messages to your baby, all complemented by heart-warming images of babies and their families.